Nothing is quite certain about the origin of this small bulldog. The French claim them as a national breed, the English consider them to be a descendant of the British Bulldog. The latter landed in France in 1850s with Lace makers from Nottingham, who crossed Normandy, taking small bulldogs with them. This friendly animal normally lives to ten years of age, but with plenty of care and attention to feeding the right diet the French Bulldog can live up to 12 years of age. In peak condition the female should be about 11kg and stand 28cm while the male bulldog is 13kg and is 30cm tall. 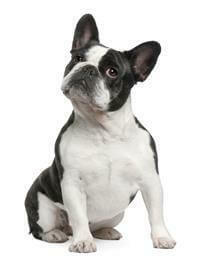 French Bulldogs are very intelligent animals, highly affectionate and friendly. They are full of courage, but can also have the qualities of a clown. They love to be around people at all times especially their owners. It is a sturdy small dog, with a large square head in proportion to their body size. Their most prominent feature is their bat-like ears. They have a very muscular body and are born with a very short tail. A friendly non-aggressive dog, compatible with most breeds. Because they are smooth-coated dogs they require very little in the way of grooming. They do shed their coats when coming into the hotter months. They will take just about all the exercise you can give them whether it be walking around the block or simply playing ball in the yard. They don't like being left out. As with any short-nosed dogs there is the possibility of breathing problems, and during the hot summer days they can suffer from heat stress. Older children and are an excellent companion dog. If you want a friend, get a ‘Frenchy’.